Well they do say that good things come to those who wait. I had wanted to visit Brighton since I was a 16 year old Mod back in 1980, and last weekend that wait finally ended. Sometimes having such weight of expectation can cause things to be either a slight or major disappointment. But on this occasion I have to say that both myself, and the large contingent we travelled down with were left with only one disappointment, and that was that it all went past so quickly. We travelled down on the nine o’clock flight from Glasgow to Gatwick and there was a good number of Mods along to add to our crowd. By half past ten (much to my relief) we had landed in Gatwick and then took the 30 minute train journey to Brighton. As we all crowded on to the train we noticed one part was particularly quiet and so took our seats in there. It may well have been the first class compartment but then we were all Mods after all, and any Mod worth his/her salt is more than worthy of that status. The first thing we did after reaching Brighton was go in for a small refreshment in a nearby bar. I am not sure about anyone else, but I most certainly need something alcoholic after enduring any sort of time on a flight. We checked in at our digs after being helped to locate it by Stevie Hughes. Thankfully I don’t think any of us managed to get too lost after that. The majority of people were meeting up down at Volks bar on the front and that was where we all headed next. But prior to that I have to say that it was an amazing feeling to walk down the street and see Brighton Pier in front of me. The walk from there to where most of the people had met up was not far, and although there was only maybe a couple of hundred scooters there, it looked really impressive in that setting. One of the first one’s that we saw was Andy from the east end of London’s TV 175, which I have to say is class. Well done mate, you have a scooter nearly as cool as mine ha ha. Down at Volks we caught up with more of the Glasgow crowd, of whom around ten had travelled down by van in order to bring their scooters with them. 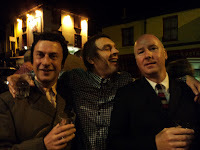 We also bumped into a few people that we knew from the Mod Generation site including Harry, and Paul. I thought I saw a glimpse of Monkey T when I was at the bar, but by the time I had got served and gave the drinks out she was not there any more. Although it had started to rain slightly at this point it was one of the few times throughout the whole weekend when the weather was not so hot. After ten minutes the sun came out again and stayed that way for the majority of the time we were there. I think we stayed down on the front for quite a while, soaking up the atmosphere and having a few drinks before heading up to the digs around 7 pm. A short resting of the eyes followed and then we were up again around 8 pm to get ready to hit the bars near to the Komedia for the night time do. If the atmosphere down at Volks bar was great, I would say that it was even better outside the Dorset and Heart and Hand pubs, and that is despite the dodgy name of the latter if you know what I mean Mr Lawson. Both pubs were jam packed and everyone was on the pavement drinking outside enjoying the chat and the music coming from both boozers (provided by The Modesty dj's). Everyone looked great gear wise, and now and then a few lovely modded up scooters would buzz past adding to the overall feel of the place. I think we headed into the Komedia around half eleven just to make sure there was no hassle with the printed tickets we had. Size wise I would say that the venue for the Brighton Mod weekender was similar to the one at Strathclyde University used for the Saturday night do in Glasgow. The first part we headed into was the top section where Holly, one of the Glasgow girls was doing a Psych DJ slot. It was fairly quiet at that point I have to say although it did become very busy later on. The bottom section saw a more Soul and R&B record selection and we headed down there after a while. By 1 am a few of our crowd had headed home completely tired out, and I was going to do the same thing myself. But the DJ’s kept on playing these brilliant tracks and I had to have a few dances. I eventually gave up some time after 2 am and walked the short distance from the Komedia to Kipps B&B. As far as I remember we woke up next day around nine and went for breakfast some time after that. Stevie Hughes then came down to give us a great wee tour around all the Quadrophenia hot spots, including the bit where Chalky and Dave kipped down next to the Greasers, the café that was smashed up, the Grand Hotel, and the alley where Jimmy and Steph took a quick break away from the fighting (or a quickie anyway). From there it was down to Jump the Gun and the many great wee clothes shops that are close by. After a while we then took a walk back down to the front and joined the others in the Volks bar. The run out was great although I must admit that if any of these run out’s ever start on time I will probably faint from the surprise of it all. Sunday evening was actually spent taking a small rest for once. We only had one night remaining and we were all determined to make the most of it. By 8 pm we were back at the pubs that had been so good the previous evening. And although they were not so busy to start off with due to a lot of people going to watch Quadrophenia on the big screens, it soon became packed once more. We even met up with a London Mod who had lived the first few years of his life in Glasgow and even went to the famous (or infamous) St Roch’s school. If the Komedia had been great the previous night it was even better on the Sunday. A fantastic atmosphere, and some of the music was just excellent. I don’t usually like to single DJ’s out but I thought the set done by Jo Wallace (must be Scottish blood ha ha) was top class. I stayed on to well after 3 am and then staggered merrily back to the digs for a few hours sleep. 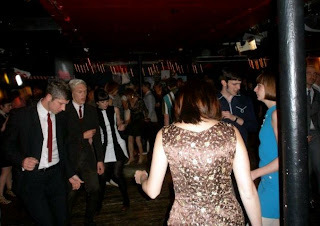 All in all I have to say that the Brighton Mod weekender was very special. Maybe it was to do with the fact that I had always wanted to visit Brighton for such an event, or maybe (and more likely) it was the fact that everything was just so brilliant. The people were great and we hardly stopped laughing or chatting all weekend. The music was fantastic, whether it be in the Volks, the Dorset, the Heart and Hand, or the Komedia, so cheers to Rob Bailey of The New Untouchables and all the dj's. The scooters and their riders were also mostly brilliant looking, and the whole place just had a fantastic comfortable vibe about it. To all the Glasgow Mods who made it: Anita, Suzanne, Holly, Sarah, Kevin, Marc, Q, Tam Armstrong, Wullie Smith (and son) Tam O’Neill, Gloky, Paul Molloy, Drummy, Peter, Davie Kerr, Andy Wylie, Ralph, Stevie Martin, Andrea, Andy fae London (a Glasgow Mod now) Jo Jo, Elaine, Jim Copeland, Stevie Hughes, Algie, and Andy Doyle cheers for the laughs. To everyone else who I spoke to and enjoyed company with, thanks for making us all feel so welcome, even if you may have struggled to know what we were saying. I know Chris would love to hear any feedback on this article or your thoughts on the weekend itself. You can add any comments in the forum here or I will pass on any messages to him using the contact address.